I’m supposed to open my textbook and start reading it. I’m supposed to start making notes and start studying! Guess I failed to do so. Well, so I guess I’ll just make this post really short and sweet. People with egg allergy are not allergic to the eggs themselves, but it is the protein inside the egg that cause the allergy. Having an allergy will tremendously affect one’s diet and lifestyle. It’s not just about avoiding the food itself, it is also about checking the labels of manufactured food to ensure that they do not contain any trace of the food that one is allergic to. I’ve gotten a recipe book on how to bake “vegan-ly”, meaning using ingredients that will avoid triggering most kind of allergies. I haven’t tried any recipes from there, but I plan to, when I have more time to play and experiment around with. 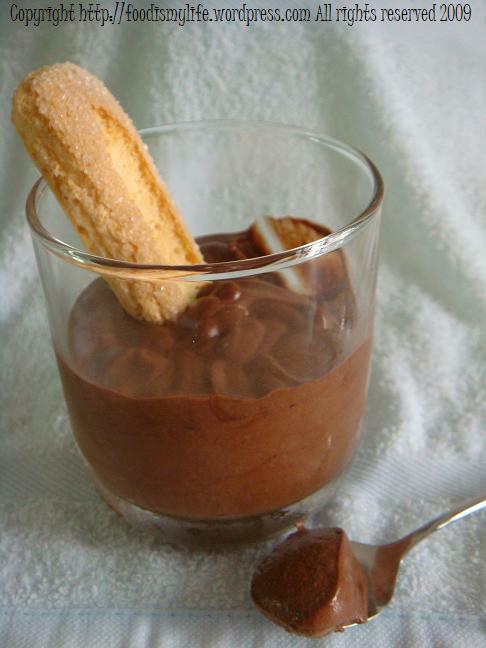 But right now, I happen to find this mousse recipe in one of my recipe collections. Most mousse recipes will require raw eggs to create the thickness of the mousse, but the good things about not using raw eggs is that it will have a longer “refrigerator” life (that’s what I believe) and it will defnitely be safe for consumption, especially for pregnant women and children. And I like this mousse. Being a dark chocolate lover, I cannot resist popping one spoonful after spoonful of mousse into my mouth. I’d probably give it a more wicked twist next time by blending liquor into it, probably Bailey’s or Tia Maria. So… if you’re in a hurry, or you want something egg-free, or you want to make something seductive and delicious, or you want all of them, try this mousse! In a microwave-safe bowl, combine chocolate and 125ml cream. Microwave on high for 60 seconds or until cream is hot and chocolate is soft and almost melted. Stir until completely melted and smooth. Let cool slightly. ALTERNATIVELY, place the chocolate in a heat-proof bowl. Heat 125ml cream in a pot until almost boiling (small little bubbles start to appear at the side of the pot) and pour it into the bowl of chocolate. Let stand for a while and then stir until chocolate has melted and the mixutre is smooth. Let cool slightly. *To make superfine sugar, process granulated sugar until they become super-fine. **Substitute 1 tbsp orange-flavoured liquer for the vanilla extract… or any liquer that you like. Thanks for the recipe. I’ve never had mousse before so wasn’t quite sure what to expect. I used Tia Maria and castor sugar. Mine didn’t turn out as glossy as the picture above, I suspect thats because I whipped in the chocolate mixture. Will have to fold/mix it in next time. Also, wasn’t sure exactly what stiffness the peaks needed to be, and didn’t want to curdle the cream, perhaps needed to whip a little longer. STILL TASTES GREAT THOUGH!!! Thanks for the recipe, Jasline. I was looking for an easy chocolate dessert recipe to use up some cream and I chanced upon this post. I made the mousse with some Valrhona dark chocolate and Cointreau and my family loved it. What I really like about this recipe is that it makes a great-tasting and classy dessert that is not too much trouble at all!